Welcome to The Naturopathic Kitchen! Using food as medicine, we go back to the basics and learn about some of our favorite spices and herbs, and how to maximize their health benefits. We tackle a new herb each week and this week is all about the beautiful passionflower! It’s not often that a plant is so aptly named as passionflower. Not only is this flower strikingly beautiful, tastes great in a tea or as an extract, but it also has powerful health benefits. Passionflower contains significant amounts of gamma amino butyric acid (GABA), which is an inhibitory neurotransmitter in our brains. This is what gives passionflower its calming effect. 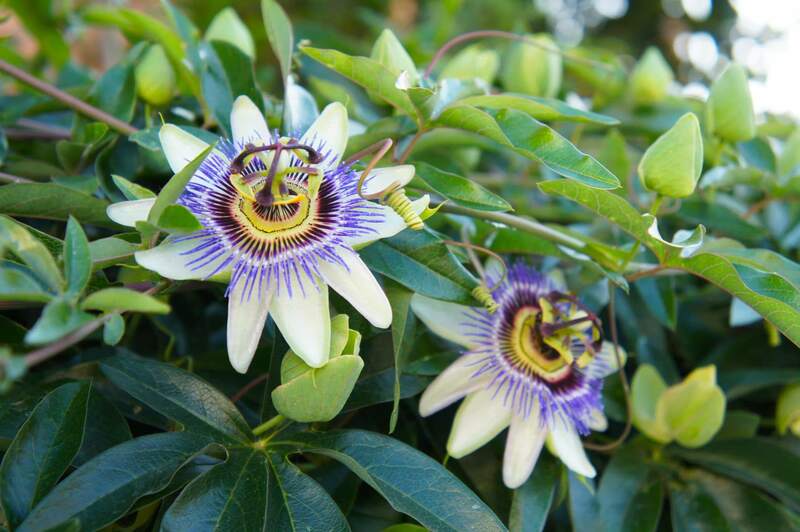 Where does passionflower come from? Where can I find it? Passionflower has a rich history of use dating back to pre-historic times. Seeds that are thousands of years old have been discovered in Virginia, where the Algonquian Indians thrived. It wasn’t until the 16th century that this beautiful plant was named by Spanish explorers in South America who surmised that this flower was a representation of Christ’s approval of their exploration. It was then named for Passion of the Christ. Passionflower’s natural habitat is the Southeast US, Central and South America. There some species that grow naturally in Asia as well. It is a vining plant that often grows on disturbed land and poor soils, and is considered a weed in some areas despite its usefulness. Passionflower is typically found as dried herb for making tea or as an extract in the form of a tincture. The dried herb can be found at health food stores. Extracts are best found at herbal shops or online. How does passionflower help my health? What medical conditions/symptoms is passionflower good for? When should passionflower be avoided? Since passionflower is a sedative, it is best not to use when operating heavy machinery or combining with other sedating drugs or narcotics. It can also cause the uterus to contract when taken orally so don’t use passionflower when pregnant. There is no current evidence to show that passionflower is safe while breastfeeding, so it is best to play it on the safe side and avoid during lactation. Let’s try passionflower out with some cool recipes! Looking for a way to exfoliate and indulge in the aroma of passionflower? Try making a scrub! Gently combine salt (or sugar), passionflower and your oil of choice in a glass bowl. Add up to one teaspoon distilled water for consistency. Store in an air-tight container. Thank you to Bustle for this recipe! Place passionflower leaves into a cup and fill with boiling water. Let steep for five minutes, strain and enjoy!